Editor’s Note: This is an excerpt from Brian Solis‘s new book, What’s the Future of Business? Learn more about the book and purchase a copy at http://wtfbusiness.com. Over the years, businesses have developed sales, marketing, and service strategies around the sales funnel. The model of awareness, interest, desire, and action describes the likely steps a customer may take in making a decision. If only the world were that simple. It was assumed that the linear path of the funnel would continue despite the evolution of technology and behavior. Today, the customer journey goes beyond a simple sales funnel. Yet it is the funnel model that dictates how businesses invest in product development, sales, marketing, and service strategies. It’s a big problem. In a narrow, but honest, view businesses are designed to pull customers into the funnel. Strategists see people as targets and use marketing, not products or exceptional experiences, as bait. It’s assumed that customers make decisions that follow a series of linear and equally weighted steps to find and purchase your products and then later advocate to anyone and everyone on your behalf. Convince the prospects that they need your product without considering their need, experience, or the reward. This is done through clever marketing and advertising. Contests and campaigns also raise awareness to create need or the perception of it. Emphasize the reasons to buy in the moment rather than the long-term relationship or outcome. Packaging, price, rebate, gifts, and promotions are often the lure necessary to convert browsing into action. Convert the prospect into a customer. This is the moment someone officially becomes a stakeholder. There is an exchange beyond the payment for a product. Value must now be delivered on both sides of the relationship. The distance here is that the space between the brand promise and the customer experience begins to spread. If a customer encounters anything negative, the distance is then measured by the steps it takes for a customer and business to connect and bring about resolution. Realizing that the customer experience is not completely understood, this stage is dedicated to finding ways to keep customers interested and coming back. Strategies include discounts, promotions, exclusive offers, loyalty programs, and beta tests, among others. Once customers are enticed or in some cases ensnared, the relationship moves into a state of customer relationship management. You’re now forever known as a number with a record on file. Conversations are now managed as tickets and placed within a queue for engagement and resolution. Your service level and attention level can be tied to your position within the customer hierarchy. The blaring noise that customers continually experience has forced them to adapt. Second nature acts as a defense mechanism to tune out the constant barrage of marketing messages and clever campaigns. 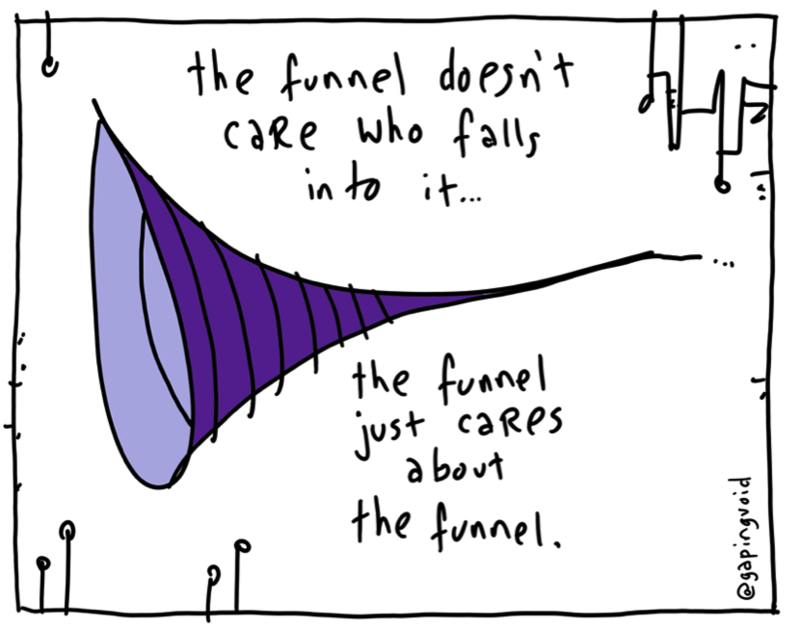 Awareness at the top of the funnel is elusive but the stakes have never been higher. What was once a simplistic representation of a fluted customer journey must become much more dynamic and connected. Learning how to uncover the moment of truth and shape experiences will set the stage for more meaningful outcomes and relationships. Your market has already been disrupted. Through an unforgiving series of technology revolutions in an era of individual empowerment, your customers are not only more informed, their expectations have grown. It’s time to turn off the funnel vision and write a new future of business. Brian Solis is principal at Altimeter Group, a research-based business advisory firm in San Francisco. Solis is recognized as one of the most prominent thought leaders and published authors in new media. A digital analyst, sociologist, and futurist, Solis has studied and influenced the effects of emerging media on business, marketing, publishing, and culture. Author of the bestselling books The End of Business as Usual and Engage!, Solis recently released his new book, What's the Future of Business (WTF).